Between keeping the lights on and managing your staff and doing the accounting and all the other roles that come with the territory, you've got plenty on your plate as an entrepreneur. We're going to add one more thing—small business press. Why bother investing time into media outreach? Well, quite frankly, it's free publicity just hanging out there—ripe for the taking—that will otherwise spoil when opportunities are missed. Drawing from my own experience, I appeared on a Minneapolis lifestyle news program a couple of years ago to highlight locally made holiday gifts. Within one day, each of the three businesses in the feature reported that several people had called or stopped in specifically because they saw something they liked on TV. Those are real customers through the door who had no idea these businesses existed the day before. These opportunities might seem hard to come by, but connecting with media outlets can be easier than you think. Here are a few tips to get started. 1. Tell stories. Reporters are not interested in giving you a free commercial to tell the world about why they should buy your stuff, but they are interested in stories that fit their audience. 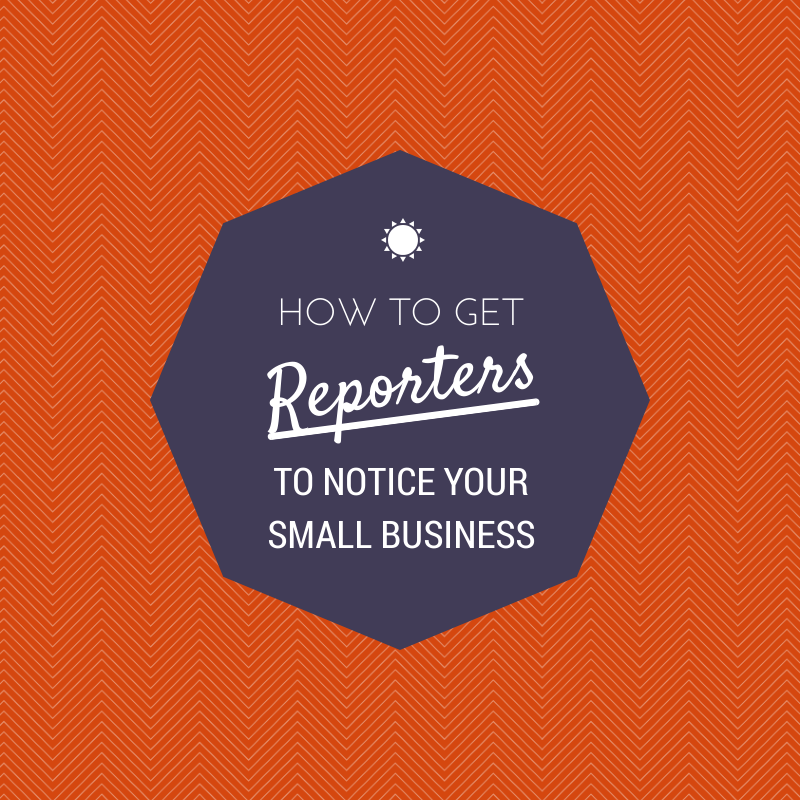 If you can tell a new, informed, colorful story, reporters will want to talk to you. What kinds of stories? -How you started your own natural health business after 10 years as a successful pharmacist. -Why you are organizing a benefit for the fire-damaged shop across the street. -How you are crowdfunding and crowdsourcing ideas for your second location. 2. Be the expert that you are. Or introduce reporters to experts you know, using your business as the backdrop. Reporters remember community connectors. -How you are the only person in the world who makes jewelry cast from a tiny octopus. -How you navigated the state's new brewery regulations. -How two of your gym's best customers are a husband and wife duo training for Olympic ski jumping. 3. Use your inventory. Let your products be the story. Get personal with it. Get generous with it. Get weird with it. -Drop off a Pinterest-worthy picnic basket filled with your signature maple syrups to all the local television stations with a handwritten note before National Pancake Day. -Ask a local artist to build a diorama made out of noodles (using some of the 2,000 types of you have at your Asian grocery store) and invite food journalists over for a bite to eat. -Those tiny octopus earrings? Bring 'em back out and invite a major fashion blogger to style them into one of her outfits and see invite her for a tour of your studio. Do you have any other media tricks up your sleeve? Let us know in the comments or say hi on Twitter!